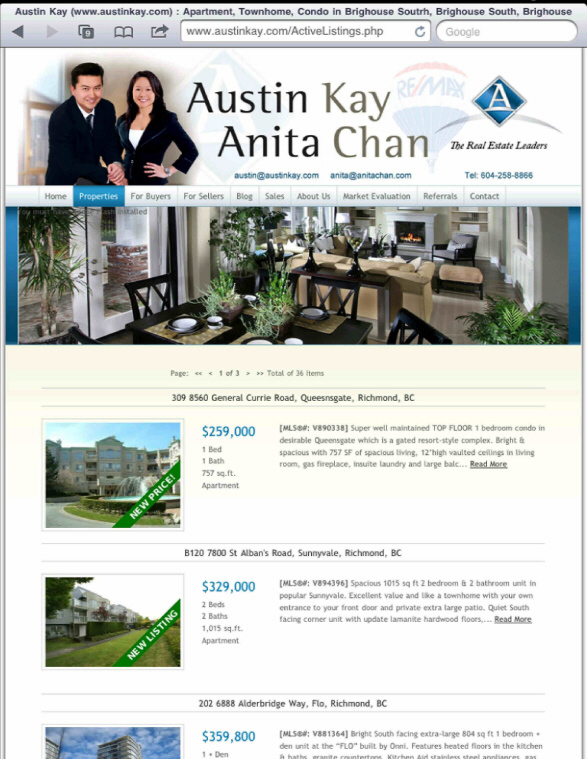 Professional expertise, dedicated customer service and the commitment to succeed have distinguished Austin Kay and Anita Chan to be one of the most popular choices in selling Real Estate. With over 23 years of experience and 3000+ Homes SOLD to date, we have a proven track record and an exceptional understanding of our local and global markets to help advise our clients so they can maximize the value of their home. 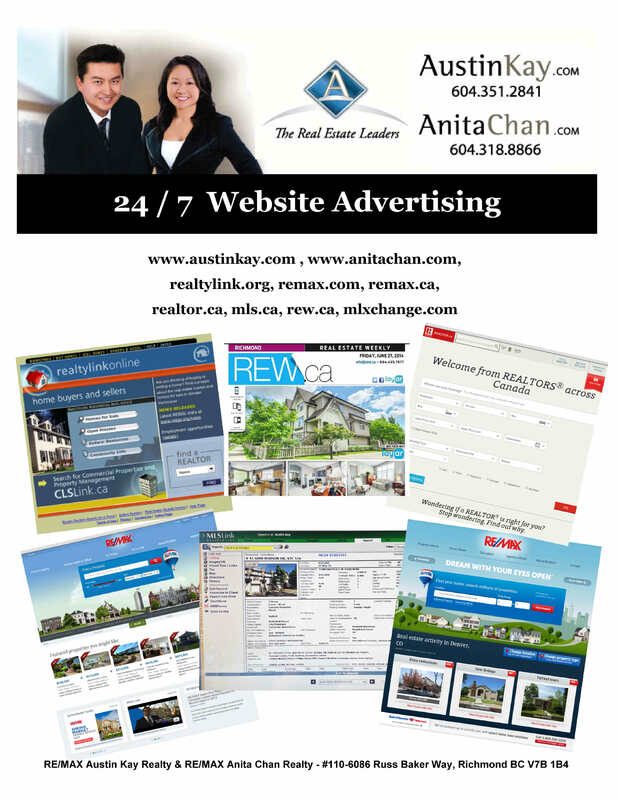 Our website is one of many methods of advertising that we use to market & expose the properties that we represent for sale to millions of prospective purchasers locally & internationally. Outlined below is a brief list of only some of the advertising you can expect from us to ensure that we reach the maximum number of propective buyers for your home. ■ Bus Bench Advertising - 24/7 advertising on 45+ hand picked locations in Richmond advertising our website. 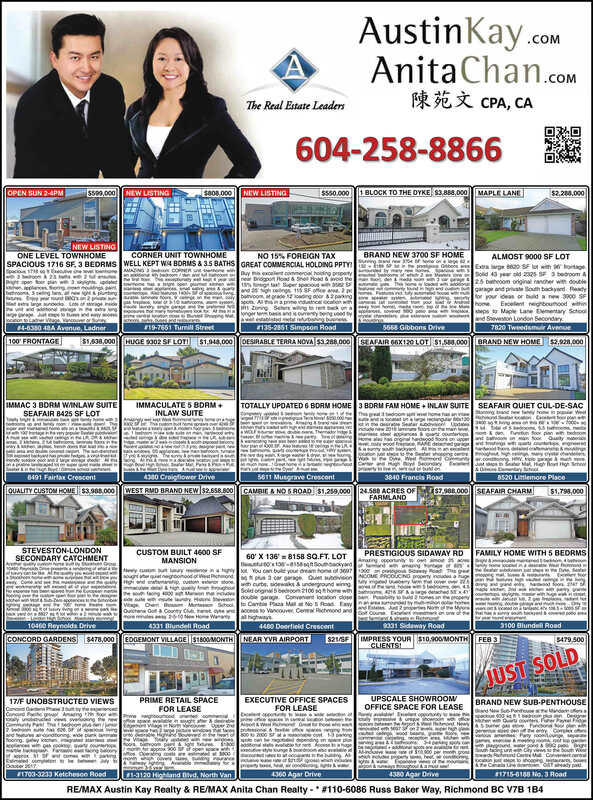 ■ Yellow Page Advertising - 450,000+ copies curculated in Richmond & South Delta. Full Page color ad on the Outside Back Cover delivered to every home, business and most importantly in every hotel room to reach out to anyone new in town looking to purchase real estate during their stay. 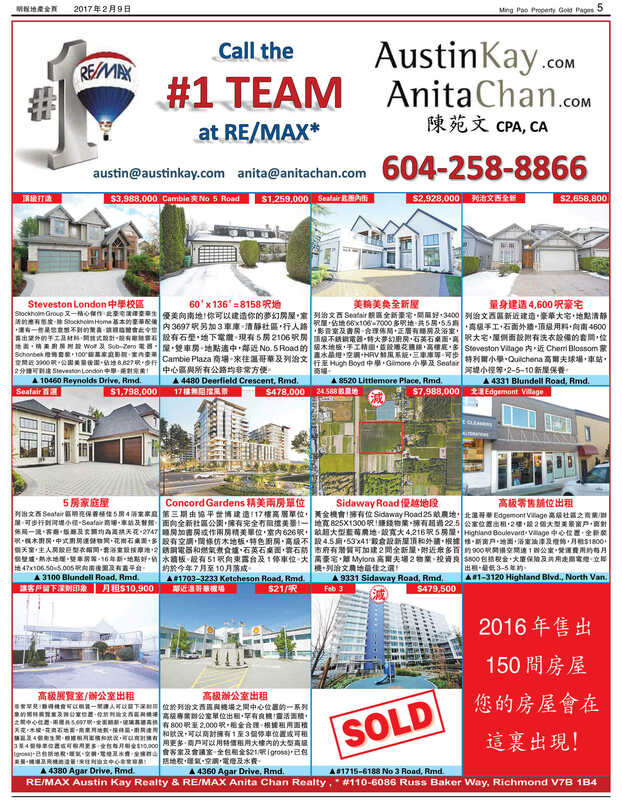 ■ Just Listed flyers advertising your property in your neighbourhood or complex to have your neighbours tell all their friends. 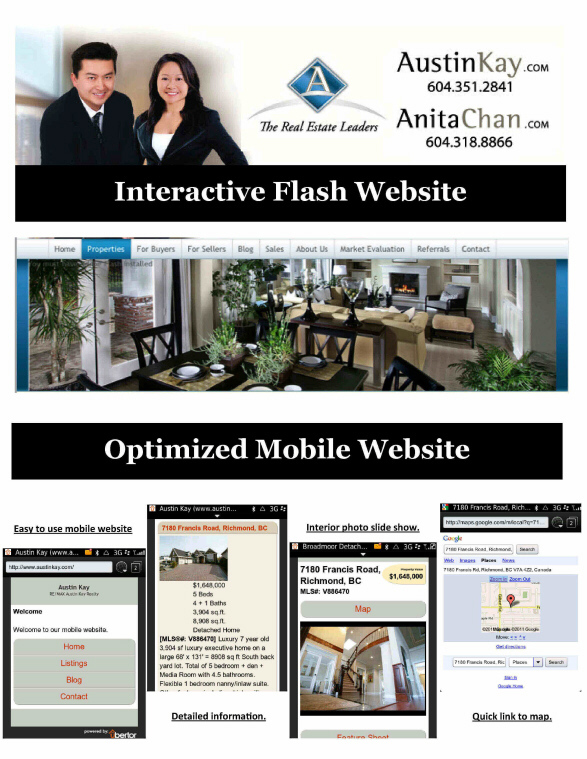 ■ Internet advertising on Google & other Social Media platforms to create added exposure to our website and your home. 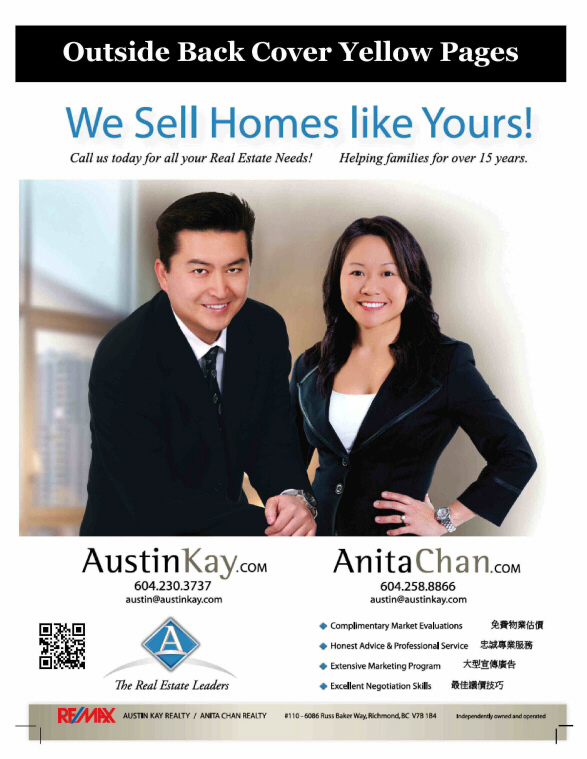 Call Austin Kay & Anita Chan at 604-258-8866 today to have 1 of the Best Teams in Richmond on your side to sell your property! 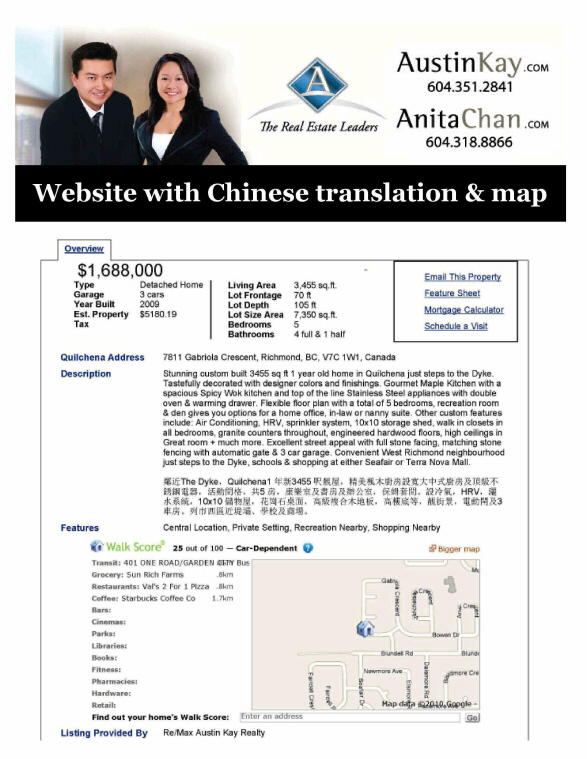 Irene & Rick Butler - Having been in real estate myself for 15 years prior to retiring, I knew from my first meeting with Austin Kay that he was the professional to handle the sale of our home in Richmond upon our relocation to Kelowna. And Austin even super-ceded my high expectations! He is the most professional, efficient, knowledgeable, congenial, dedicated agent that I have ever dealt with. I highly recommend Austin to anyone moving into or selling a home in Austin’s sale area - as he goes above and beyond to take care of every detail to ensure a successful transaction. Much appreciation, Austin – you are the best! Darcey & Carl Besemer - Austin and Anita have helped me in several sales and purchases in the last few years. They take this experience to a whole new level. I truly believe through our experiences together that they have my best interest at heart! They work endless hours, and really listen to what I want, making the process so much easier! Although there is no doubt in their professionalism, they treat me like a friend, not just another client! I would recommend this amazing team to anyone! Peter Su - Listed my house for sale with Austin, the most seamless and worry free experience I've had. In my opinion, the biggest difference when compared to other less experienced agents I've used before are the amount of data available and the experience they can draw from past deals they've done when you are faced with a unique decision.